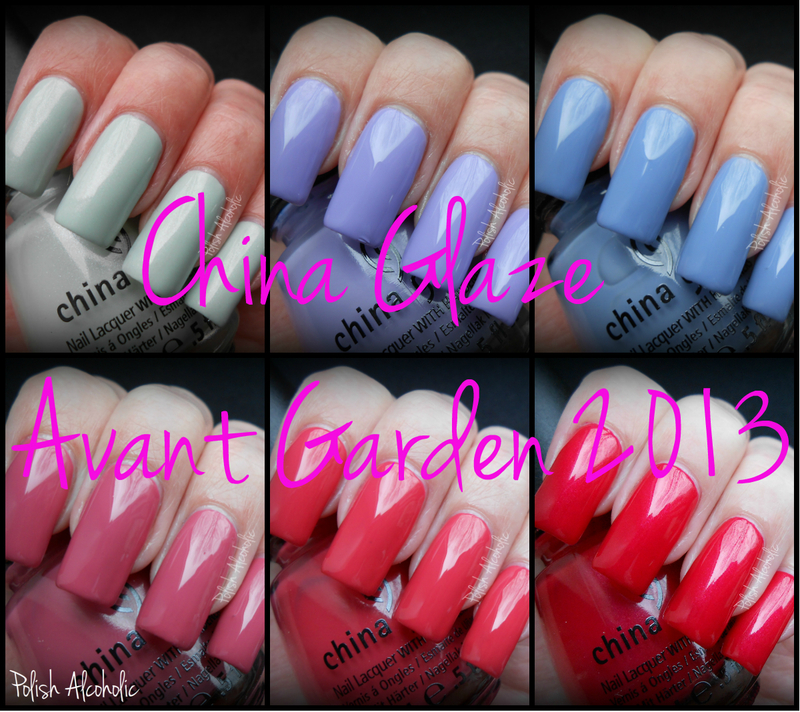 Today I have my six picks of the Avant Garden Collection by China Glaze to share with you. All swatches have a base coat, two coats of color and one coat of Seche Vite. Keep calm, paint on, a mint green cream with lots of fine silver shimmer. The formula is on the thick side but the application went fine. A great shade for Spring! Tart-y for the party, a lilac cream. The formula is again on the thick side and the first coat is was a little bit streaky. The second coat smoothened it out to a lovely opaque shade. Fade into hue, a lovely periwinkle cream. The formula is slightly thin and tends to run. But the application went fine. The first coat was a bit sheer but the second coat -surprisingly- made it completely opaque. 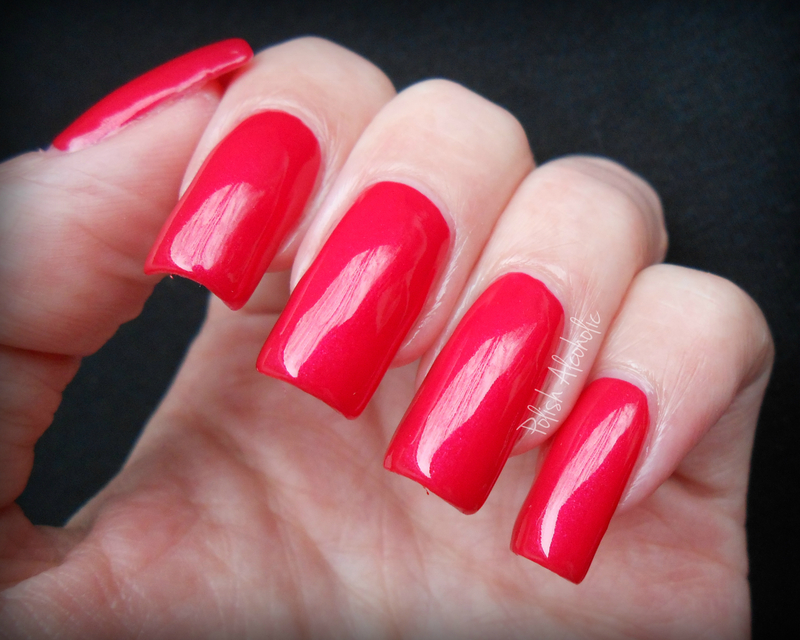 Passion for petals, a bright red cream with lots of pink undertones. Formula is great and easy to work with. Love this! Did you pick up any of the Avant Garden Collection? Which one(s) is/are your favorite? This entry was posted in China Glaze and tagged china glaze avant garden, china glaze avant garden collection, china glaze keep calm paint on, china glaze life is rosy, china glaze passion for petals, china glaze snap my dragon, china glaze spring 2013, china glaze tarty for the party, chine glaze fade into hue by Polish Alcoholic. Bookmark the permalink. 😀 Ik ook! En ze zijn perfect voor de lente! lol.. they are all pretty ha! Oh wow these look really nice on! I saw the previews online and thought they were kinda meh…but they look really great! I got 6 of the Avant Garden colors, but many of them are different. I was just painting them on a nail wheel tonight so I could make sure to know what they looked like without having to swatch on my nail next time I wanted to wear one. I’m a huge fan of the frosty white one called Just Dandy Lyin’ Around. So pretty and clean. It’s not too much sparkle. I also like Fancy Pants. I’m a sucker for a purple. I’m a sucker for purples too 🙂 I didn’t purchased the white shimmery one because I thought it would be very sheer. How many coats does it need to get opaque? I used 3 thin coats. Since I don’t have long nails, I could have pulled off 2, but it looks better with 3. With my shorter nails, it made me think of mini marshmallows. 🙂 I’m in love with the way it makes my nails look. It has the same type of shimmer that Keep Calm and Paint On has. It’s very pretty. I bought Keep Calm Paint On the other day. I love mint greens and this one looks really pretty in your swatch – looking forward to trying it out. 😀 It’s way more shimmery than the picture shows. I think you’d love it! Okay, these are fabulous. Where do I buy them? You went for it, then! Which is your favourite ? OOH! Snap my dragon is so bright and pretty! I don’t wear a lot of red, but I could definitely rock that color! 😀 In real life its even more stunning! Great swatches! I think I’m going to buy Tart-y for the party someday.